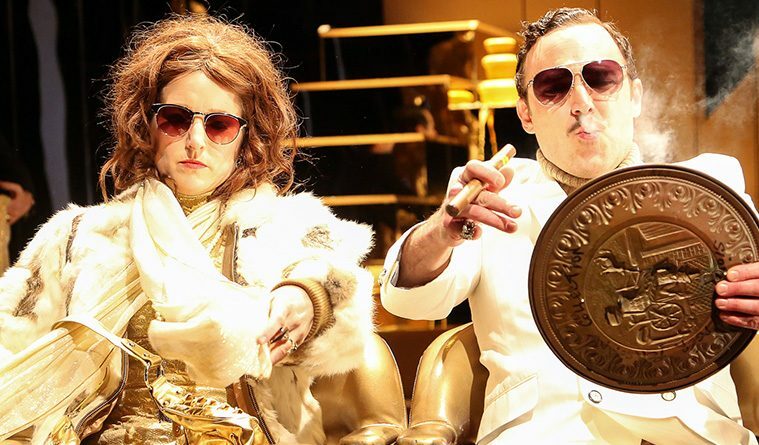 Hannah Kenah, Jason Liebrecht in Stop Hitting Yourself, LCT3/Lincoln Center Theater at the Claire Tow Theater, January 2014. It strikes me as charmingly fitting that the Rude Mechanicals see queso as a symbol of decadence. The choice speaks to the Austin-based theater collective’s down-to-earth, welcoming attitude, and their humility in the face of tremendous national success. The quintessentially Texan dip symbolizes the group’s native roots and flows from a queso fountain in Stop Hitting Yourself, their newest work, which was commissioned and premiered by LCT3/Lincoln Center Theater, New York City, 2014 and ran to mostly sold-out houses for six weeks. 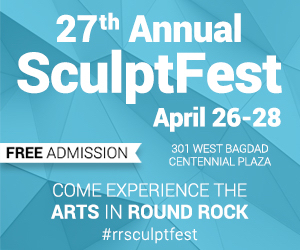 Now, the show is coming to Dallas, May 28-30 at the Wyly Theatre as part of AT&T Performing Arts Center‘s Off Broadway on Flora Series, which will, surprisingly, be the Rude Mechs’ Dallas debut. And the queso in Stop Hitting Yourself is just one of the examples of their quirky sense of humor. Rude Mechs’ playwright Kirk Lynn laughingly explains the rich, golden liquid as their version of what posh looks like. “If we go to a nice restaurant, for us, there’s queso at the table. That’s kind of a signifier that you’ve made it.” Because queso is extra, more than just the free chips and salsa that come with your meal. 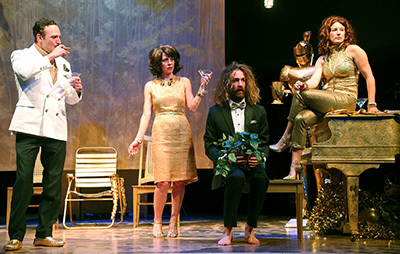 Jason Liebrecht, Lana Lesley, Thomas Graves, Hannah Kenah in Stop Hitting Yourself, LCT3/Lincoln Center Theater at the Claire Tow Theater, January 2014. Photo by Erin Baiano. So when Lynn was drafting a play that would explore the decadence and steely individualism of late-capitalism, he wrote “there is a fountain of queso” into the stage directions, largely as a signifier of ridiculousness. And in the way that most Rude Mechs pieces come together, the queso fountain stuck, turning into an essential part of a play that began with a short list of ingredients: Busby Berkely, Ayn Rand, confessions, and tap dancing. All of that somehow spun into a tale of royalty, privilege, and merciful condescension colliding over a wild man of the forest and a charity gala… with queso, and singing, and audience interaction. Director Shawn Sides has a hard time explaining their process for devising new work since it’s such a collaborative unfolding of disparate ideas. Their pieces usually start with a few core elements and evolve as the team rehearse and workshop the shows in front of audiences. Field Guide, their current work-in-progress (commissioned by Yale Repertory Theatre), brings together The Brothers Karamazov, stand-up comedy, meditation, and acting cubes in an effort to figure out how to be a good person. Or maybe how to live a better life. Or possibly (hopefully?) both. 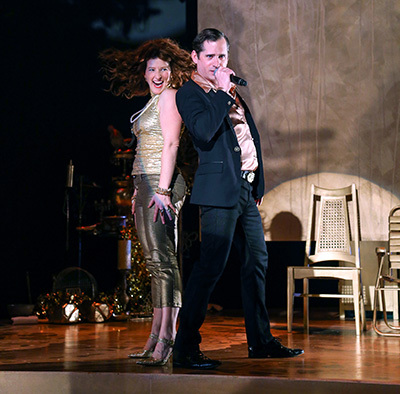 Hannah Kenah, Joey Hood in Stop Hitting Yourself, LCT3/Lincoln Center Theater at the Claire Tow Theater, January 2014. The full title was the starting point: Field Guide for Better Living. To that, they added The Brothers K as a skeleton – a literary classic that brought enough cultural baggage with it for audiences to have some familiarity, and which more or less looks at the search to be a good person. Then everyone brought their interests to the rehearsal room, and the play started to take shape. Actor Thomas Graves, another of the group’s Co-producing Artistic Directors along with Sides and Lynn, found that kind of collaborative creative process enthralling when he stumbled upon the Rude Mechs roughly a decade ago. After graduating college, Graves planned to be nomadic for a while, working his way across the country volunteering for theater groups. But after getting cast in his first Rude Mechs show, Graves fell in love with their way being. Graves sees the seemingly random combinations of materials that make their way into the group’s shows as a fascinating testament to a whole bunch of people working together. He explains that their process isn’t linear, where they start with Brothers K and get to acting cubes (his personal hobby horse in Field Guide). Rather, everyone brings their ideas to the room and they smash them together and see what works. 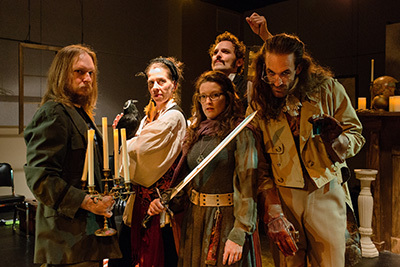 Joey Hood, Jason Liebrecht, Hannah Kenah, Lana Lesley, Heather Hanna and Paul Soileau in Stop Hitting Yourself, LCT3/Lincoln Center Theater at the Claire Tow Theater, January 2014. Photo by Erin Baiano. With twenty years of collaboration under their belts and no end to the national tours in sight, the willingness to hear each other out has served the company well. With three shows currently touring, two plays in development, and a re-mount on the horizon, the Rude Mechs’ biggest problem these days is getting everyone in the same room. 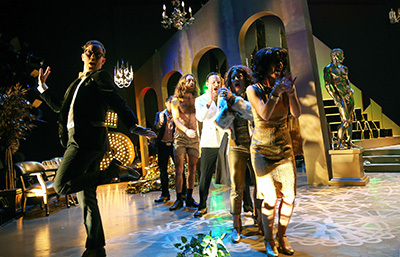 Robert S. Fisher, Lana Lesley, Hannah Kenah, E. Jason Liebrecht and Thomas Graves in Rude Mechs production of Now Now Oh Now. Photo by Jeremy M. Lange Photography. The group’s calendar is both exciting and daunting. April took them to Philadelphia with Now Now Oh Now; May brings Stop Hitting Yourself to Dallas; the company will be home in June working on their youth outreach program Off Center Teens. In July, they’ll get a bit of a break, but then it’s on to rehearsals for their re-mount of Match Play (which will be in New York in October) and their September production of Fixing Timon of Athens. November takes Stop Hitting Yourself and Method Gun to San Francisco, and (hopefully) December will bring Now Now Oh Now back to Austin (where we haven’t seen the finished product). A calendar booked almost a year out is partly to blame for the two-years it has taken the Rude Mechs to put together their book project (that will eventually be published by 53rd State Press). The work will likely include scripts for Lipstick Traces, Requiem for Tesla, and The Method Gun, along with various ephemera that are still up for debate. 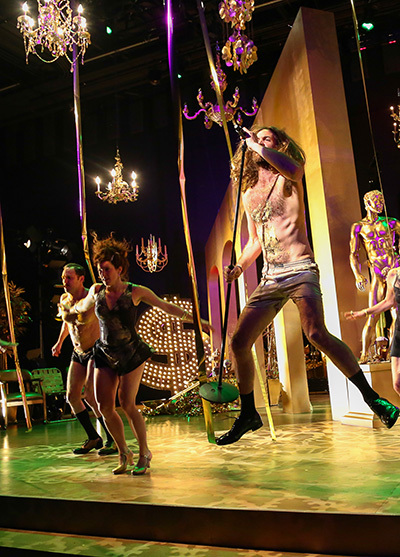 Paul Soileau, Joey Hood, Thomas Graves, Jason Liebrecht, Hannah Kenah and Lana Lesley in Stop Hitting Yourself, LCT3/Lincoln Center Theater at the Claire Tow Theater, January 2014. Photo by Erin Baiano. The book will likely include company members’ memories of how productions took shape, which, with so many people involved over so much time, are bound to yield interesting divergences. Even asking bout the origins of the queso in Stop Hitting Yourself yielded an array of conflicting (and entertaining) anecdotes. 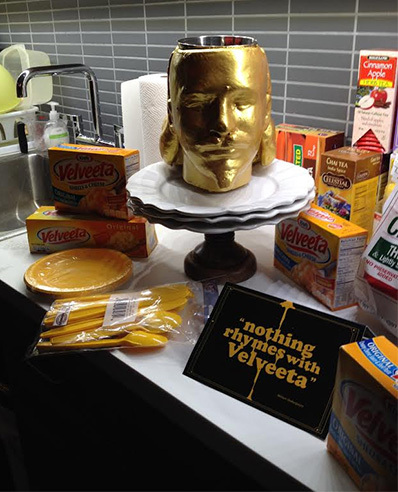 The gift package the Rude Mechs received from Kraft/Velvetta. Photo courtesy of Rude Mechs. Nobody thought it would be so hard to build a queso fountain. But ultimately, they spent hours and hours trying to find the right consistency to get the cheese to flow through the machine. And then, as the play evolved for the New York production, many more hours went into figuring out how queso splatters, how it drips, how to work with it and avoid broken legs – because, of course, queso is slippery.